Additive manufacturing, also commonly referred to as 3D printing, is a manufacturing process by which material is added, layer by layer, to build a part. The process starts with a 3D model that is designed in the user’s native CAD program. That part is then analyzed and sliced into in many sections to create a build plan for the part. The popular technologies for additive manufacturing include Stereolithography (SLA), Selective Laser Sintering (SLS), Direct Metal Laser Sintering (DMLS), Selective Laser Melting (SLM), and Fused Filament Fabrication (FFF). There are other technologies as well. The are many benefits of additive manufacturing. These include shorter lead time for parts, creating parts that cannot be created by traditional manufacturing methods, lighter parts, less waste, less skill required to operate, no tooling changes between designs, and the ability to use a large variety of materials. There are an amazing array of metal, polymer and polymer matrixed materials and ceramics available today. The features in SOLIDWORKS can help identify design or geometry problems early in the design phase to reduce costs and save time. We are going to introduce some of these features that will prepare designs for additive manufacturing in general. 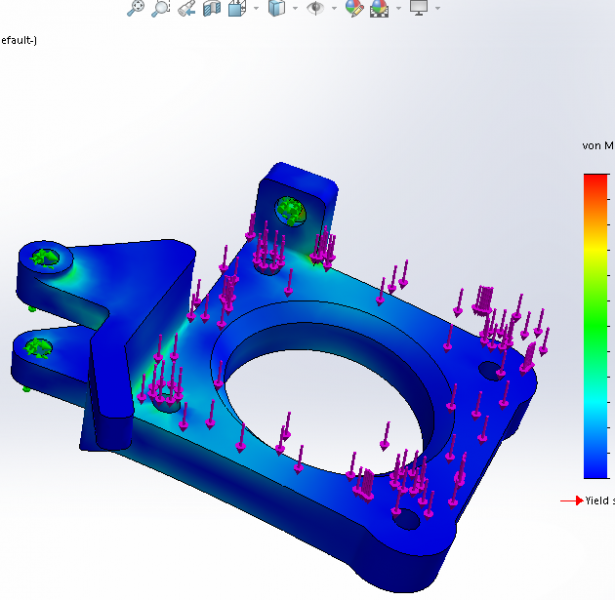 SimulationXpress is a free tool that is activated within SOLIDWORKS that enables first-pass finite element (FEA) analysis right inside the SOLIDWORKS software. SimulationXpress helps engineers and designers make sure that the part they are designing will function as designed, which is important when deciding if your prototype can be functional. If you need a functional prototype, low-volume production part, a jig, a fixture or tooling, a plastic part may fail a stress or deflection test, then you need to consider your materials. An important thing to note is that most parts that are created with FFF or similar technology will not have 100 percent infill by default. An infill percentage will often be used when talking about 3D printed parts. Most of the internal material will be layered in a matrix or lattice structure and not be 100 percent solid or dense. The designed parts will not have the strength of a part with 100 percent infill (fully dense), but the tool is still valuable when comparing stress and deflection across materials. SOLIDWORKS introduced a feature a few years back that makes printing to 3D printers as easy as 2D printers (laserjets and inkjets) by printing to the 3D printer from within an application (SOLIDWORKS). This feature did not quite catch on with 3D printer manufacturers, but there a few printers that support this feature like Makerbot. Many 3D printing companies provide their own software instead. The feature has a lot of value when considering it has a thin wall checker, a scaling feature to make sure parts can be printed accurately and a printer bed volume checker to see if your part will fit without changes. This feature will also try to orient the part so that it will fit on a 3D printers’ build bed. All of this and add the ability to check where supports may be necessary. This is a feature rich tool and should be at least used before sending a file to your printer. An ounce of prevention is worth a pound of cure. Geometry Analysis identifies problematic geometries that could cause problems in other applications. 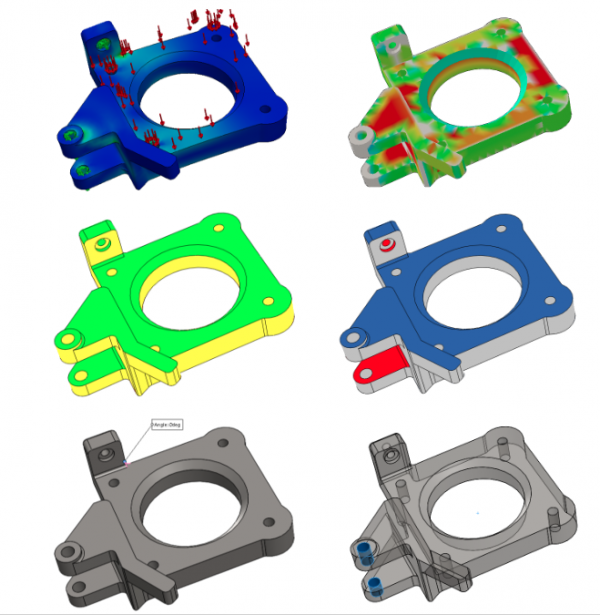 These applications include finite element modeling, 3D printing or computer-aided machining. You can specify values of control parameters to identify these geometric entities. These can be small edges, small faces or discontinuous edges or faces. You would not want your printer trying to create geometry that could fail, especially when it is trivial to fix in SOLIDWORKS. A lot of these errors occur around complex filleting operations. Fillets are important to relieve stress concentrations when making parts using some additive manufacturing processes. The figure below shows a Geometry Analysis being set up for the part being designed. Thickness Analysis is a very important tool for all parts that are manufactured whether using additive or subtractive manufacturing. Each 3D printing method will have unique design guidelines for part size and wall thickness. In SOLIDWORKS, these can be input as parameters to generate feedback specific to your 3D printing process. Very thin walls can buckle or fall over using additive manufacturing using any material. Thick walls may be an issue for some additive manufacturing processes as well. The same tool will identify those regions as well. As you can see in the image, SOLIDWORKS automatically senses where either thin walls or thick walls exist in your part. These may not always be obvious depending on your designs complexity. These features are typically for mold design applications, but they are very useful when looking at additive manufacturing applications. SOLIDWORKS users just need to define the “pull” direction or the direction which the part will be constructed from and a defined angle threshold and SOLIDWORKS does the rest. Whenever there is an undercut condition or faces at angles approaching or exceeding 45 degrees, supports are often necessary. 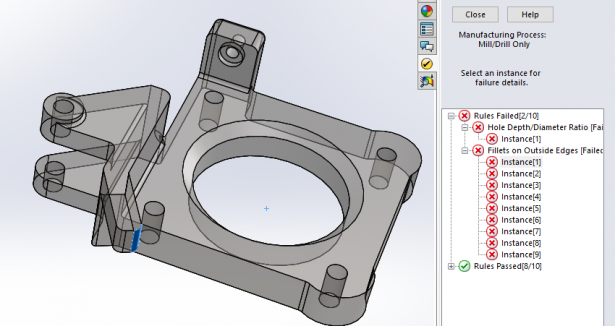 Supports should be avoided when possible, so it is important that SOLIDWORKS tell you when these conditions exist, so you can address them right there in the software. Depending on your print method, supports can be difficult to remove after printing and can leave very rough surfaces. In the image above, the red and blue faces would need supports, while the yellow and green would not. The yellow and green faces will not need supports as they are under the angle threshold in the direction of building the part. 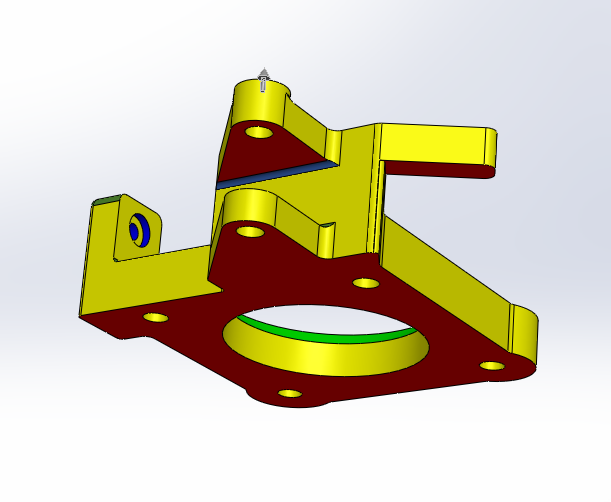 DFMXpress is a free tool that you need to activate inside of your SOLIDWORKS software. This tool has nothing to do with additive manufacturing. In fact, it is geared towards milling and drilling. These , which are both subtractive manufacturing operations. The value in this tool here is to show where the use of additive manufacturing would be advantageous when machining will be hard or impossible. The image below shows areas of the designed part where it will be difficult to mill or drill using subtractive manufacturing. You can use the features above with most all manufacturing processes including a new process called Bound Metal Deposition™ (BMD). BMD is the print technology behind the Desktop Metal Studio System™ by which bound metal rods—metal powder mixed with polymer binder—are heated and extruded to create 3D printed metal parts. All components of the system are safe and office-friendly, and there is no need for major facility upgrades to run the printer. Not only can you make prototypes for form and fit, you can also make prototypes for function as well. These are real metal parts that can perform to design criteria. These parts can be available in a couple of days using the Desktop Metal Studio System. Often, it takes weeks to get a metal part machined due to existing machining commitments or outsourcing. Other applications of parts from the Studio System are for low-volume production, jigs and fixtures, and tooling. 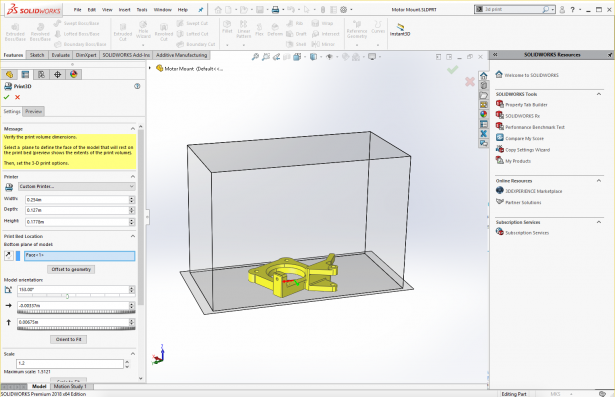 The image below shows a SOLIDWORKs model on the left and the metal part printed using the Desktop Metal Studio System on the right. That same SOLIDWORKS model can be uploaded to the control software for the Studio System and printed. There is no need for STL or other neutral file formats. 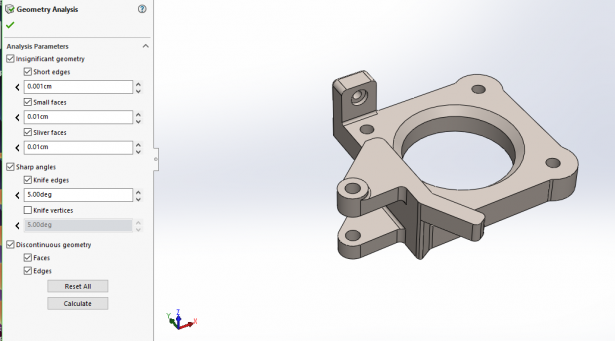 SOLIDWORKS helps designers and engineers shortcut the part iteration cycle by identifying areas for redesign prior to print. While many 3D printers have proprietary software with geometry analysis, orientation modification, and geometry detection built in, finding these issues at the print stage, means engineers are going between their CAD programs and the print software to modify and ready their parts for print. 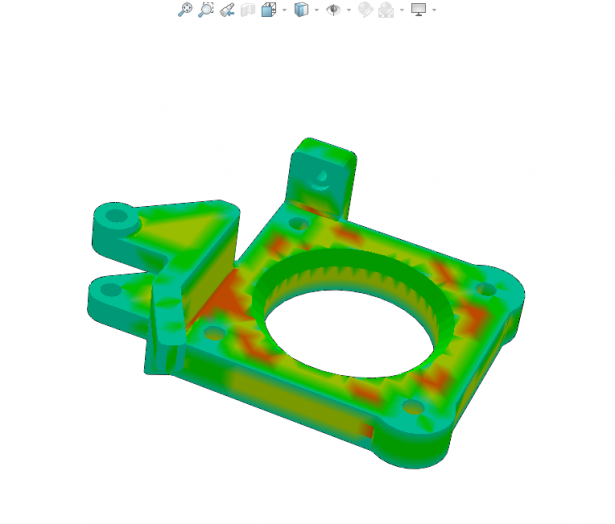 With use of these tools, SOLIDWORKS users can detect upfront potentially problematic areas for a 3D printing process; edit directly in the program; and as a result, greatly improve print performance and lower iteration cycles due to failed prints. Aaron Kelly is currently a marketing consultant for Desktop Metal helping them connect to engineers and designers. Prior to Desktop Metal, Aaron worked over 18 years at Dassault Systemes SolidWorks Corp. in many roles from Tech Support Engineer to Vice President of Product Management. He has also held Vice President of Product Management roles at Ipswitch Inc. and Cengage and has consulted with technology companies regarding product, marketing, and go-to-market strategies.